Beds Over Bermuda grass Or: Landscape Fabric Sandwich. I hate Bermuda grass. You dig it out, it’s back within a season. You spray it with herbicide, you just slow it down. Try to smother it (a la lasagna gardening), it laughs at you. This grass is considered an invasive species. Read more about it here: http://www.texasinvasives.org/plant_database/detail.php?symbol=CYDA What I really dislike about it is it never looks good (not to mention the whole family is allergic to it, including our dog.) This is the grass used in golf courses. For a golf course to look nice, it needs serious attention. Massive amounts of fertilizer and insecticides make living next to a golf course a chemical nightmare. You can’t kill Bermuda, so that’s a plus if you have drought, but you also can’t control it. Despite my attempts to keep it out of my flower beds I still have to aggressively pull it each season. This means eventually all things succumb to the grass. I won’t be able to keep up with it when I am at the age where I am only able to just putter around in the yard. Everything I am doing will eventually be erased or choked by this grass. That’s the bad news. The good news is you can create boundaries, you just have to police them and think ahead. Realize the way this grass grows: by seed, by stolon, by rhizome. It will have the upper hand if you don’t seal off your beds. When we moved into this home the entire back yard was nothing but grass. That actually was a selling point. I wanted a clean slate that I could personalize to my taste. If it doesn’t feed something (either me, pollinators or predatory insects) I’m probably not going to be interested. Unfortunately, the blank slate was Bermuda. I have tried several times to rid areas of this grass and it has come back and created problems every time. So, I beat it by creating a sealed container of soil. I call it my: “Landscape Fabric Sandwich”. 1 year landscape fabric dissolves over a season. It is pretty worthless at long term answers but perfect at providing a temporary barrier to Bermuda grass. I needed something I knew the grass wouldn’t be able to sprout through but also something that was not going to present a long term barrier to future plant’s root depth. This was my solution. Most of my solutions to Bermuda start with a good dose of Round-Up. My husband usually does this because I am a weinie when it comes to spraying. I have enough health problems, I don’t need to add herbicide sensitivity to them. This picture is from a tree hole we dug. But it’s the basics: spray thoroughly, wait three days and see how it looks, if you missed anything go back over it. Spray the whole area again within a week. (I’m sorry to all of you who want to deal with Bermuda in a green and natural way. If it’s possible, I haven’t been able to figure out how. Good luck with your attempts and let me know if you ever do it. I am also working with about an inch of soil over hardpan. You need a pick axe to get through it.) The next thing I did was have my husband weed eat it to the bare ground. 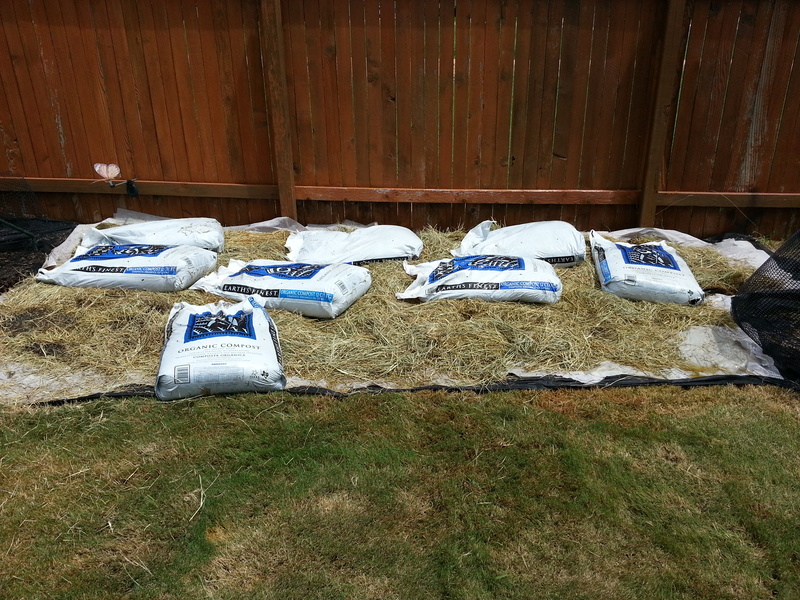 This keeps the grass from poking through the cheap landscape fabric. 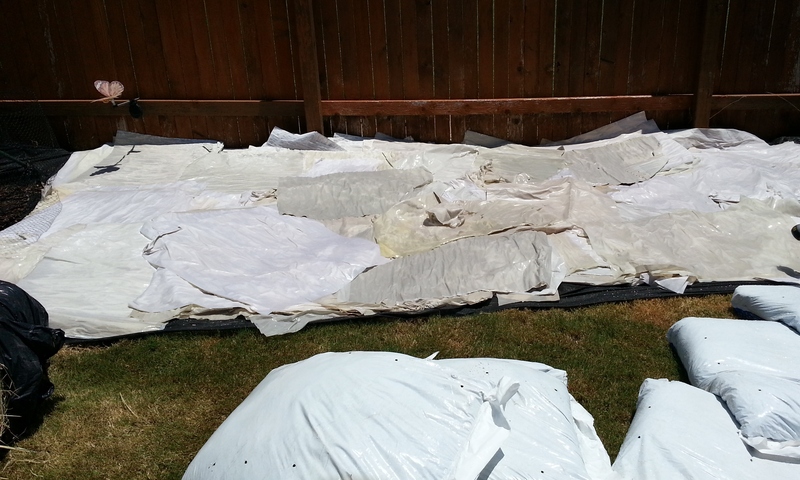 This fabric will tear and blow through your yard if you put it down and leave it, so expect to finish the bed the day you lay the first layer. I placed the landscape fabric down in overlapping layers and tucked it under the fence with a hand shovel. Then I put a layer of packing paper down. Bermuda will grow under landscape fabric. Without a solid light blocking layer, it will come right back. I wet this as I went. Next I put a layer of hay down. I use hay a lot. It is REALLY good at retaining water, you just have to get it wet before you cover it. It takes a lot to wet leaves of hay from a bale. They are packed so tightly that they are water resistant. Step on them as you water them and they will absorb the water like a squeezed sponge. Next I put the soil down. For this project I was light on soil. It was also in the upper 90’s and at this point I didn’t care. I should have used double the soil, but it will still break down fine over the next year. 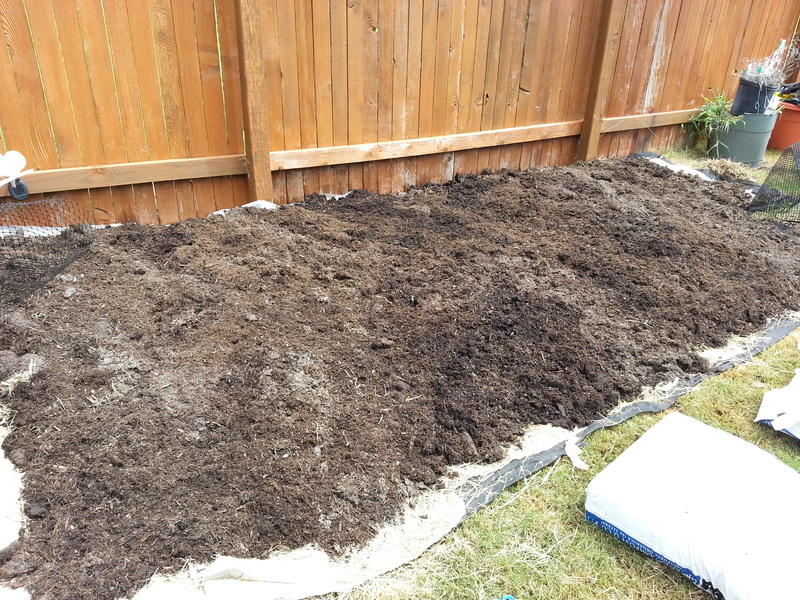 Because I didn’t have enough soil, I will need to wait to plant this bed. It just dries out too fast right now. Soil in place. (But, this isn’t a sandwich yet!) 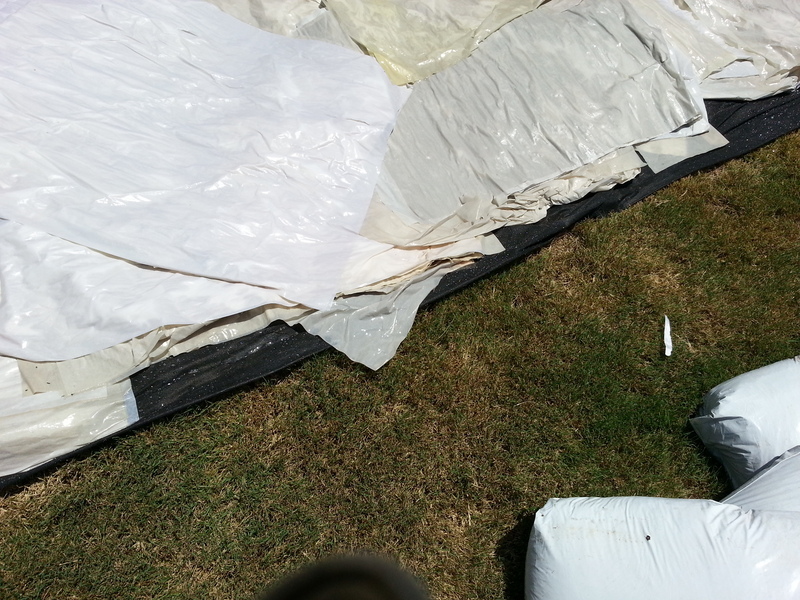 Because Bermuda also grows from seed I cover every bed I clean up with a good quality landscape fabric and mulch. This will be much thicker fabric (and unfortunately, more expensive) than the 1 year fabric. While it took three passes to fill this area with the 1 year fabric, it took 1 and a half with the heavier fabric. I tucked it under the fence again, rolled up the edges of the fabric underneath and pinned it together with landscape fabric pins. There is no opening for the Bermuda grass to get into the soil in this bed. My husband will run the edger to cut a trough and we will insert a permanent rubber barrier. Ha ha Bermuda! Take that! I may have already ceded the war, but this battle is mine! Two months later: zero Bermuda. For once, I have triumphed over the scourge of the backyard. Greetings from another Bermuda hater. There’s a cheaper, effective, though labor-intensive way to eradicate that awful grass–at least in desert areas (Tucson, to be specific) that get little rain, the soil is very dry, and the rhizomes tend not to go very deep. When I bought my place 20 years ago, I wanted to turn my entire backyard into a garden, but there was a lot of Bermuda in it. I was into the organic, permaculture approach at the time, so I built a 2X4 frame about three feet on a side, covered its bottom with galvanized steel mesh with half-inch squares, dug up the entire yard (50′ X 50′), and sifted all of the soil through the mesh, separating out and then tossing the rhizomes. When problem areas reappeared the next year (there weren’t many) I repeated the process in the affected areas. Seeds still blow in most years from my neighbors’ yards, but I try to catch the Bermuda as soon as it appears and dig it out before the rhizomes get too long. When that doesn’t work, it’s time for Roundup. Bermuda is awful and I’m glad to see there are green ways to get rid of it. We’re on almost a quarter acre of solid Bermuda. I think my body might not cooperate with your method. That’s a lot of work! My objectives for this bed were:quick and permanent with as little work as possible. I could have done it differently but this worked so well I’ve decided to repeat it for every new bed. Our soil is a real problem here too. “Heavy clay” is not only a description of the consistency but also references the actual weight of the soil here. I am struggling with both the worthless Texas soil (Soil composition down here varies drastically. I hit the jackpot for the poor variety!) and the aggressive Bermuda. I might not use this approach if I had only one or the other. I think this solution was the most efficient way I could have done it. I like that you combated yours with muscle power! Kudos to you! Thx for visiting my blog. Come back, I” be adding more. 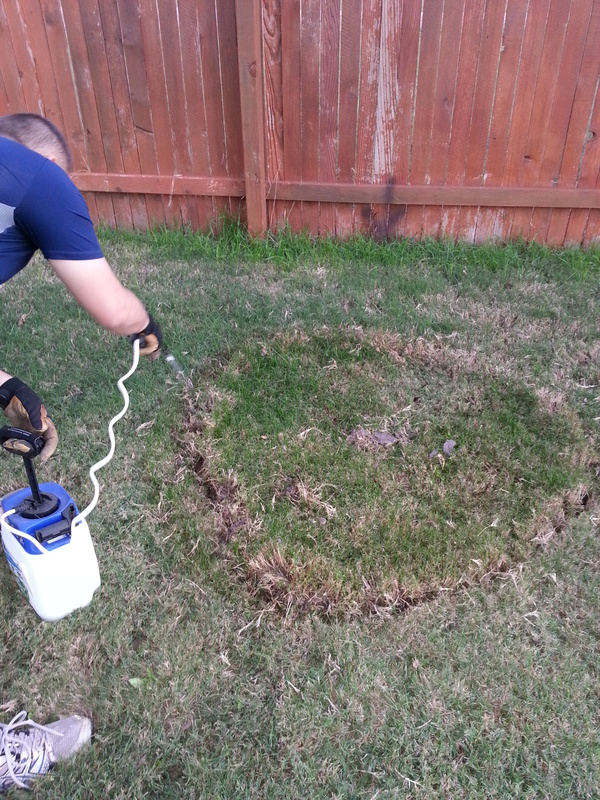 I too have bermuda grass, my method (with help-I can’t do as much as I used to) is to remove as much weeds as I can by digging and hand weeding then put thick fabric down and mulch on top. 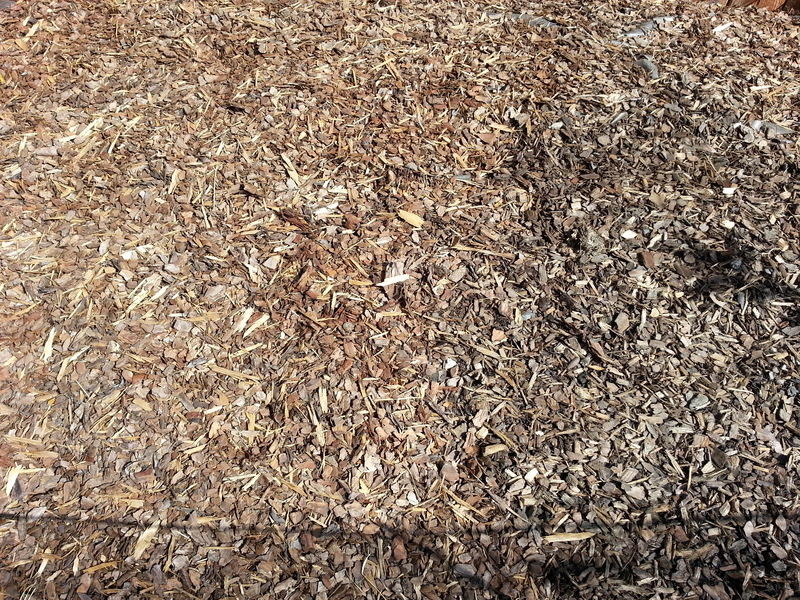 Cut holes before laying mulch for plants, or plant in containers. this fairly effective for 2 to 3 years depending on how much rain. And sometimes we get a lot even in summer in OK. Thanks for your in depth information-very helpful. Thank you for taking the time to comment! What I did was certainly a lot of work but it’s still holding off the grass. I wanted to do it quickly and add to the soil (our soil down here is close to impenetrable.) I think fabric is always part of the equation if you want to stop Bermuda. It’s really effective. That grass is a pain! Spot on with this write-up, I actually believe that this website needs a lot more attention. I’ll probably be back again to see more, thanks for the information! You are very welcome! Thank you for the visit! I appreciate it.